White Rhinoceros (Ceratotherium simum) Heading for extinction? 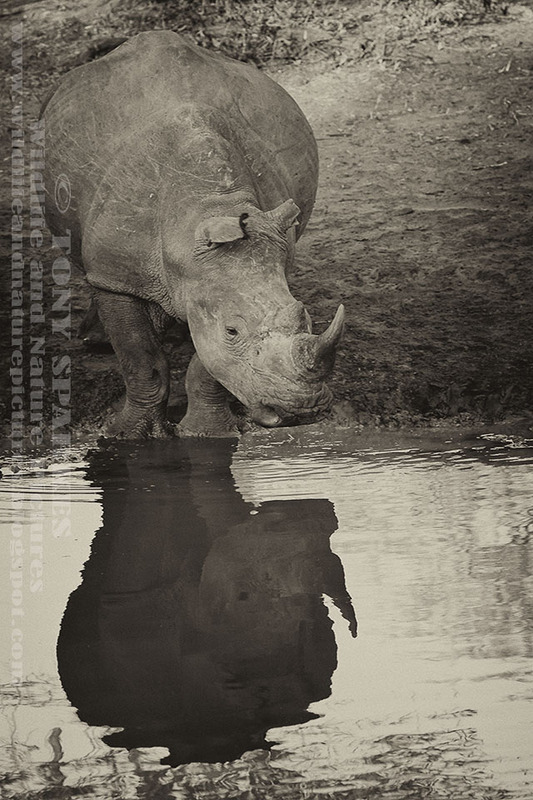 The White Rhinoceros (Ceratotherium simum) is one of only 2 species of Rhinoceros in Sub-Saharan Africa. The other species is the 'Black Rhinoceros' (Diceros bicornis). The White Rhinoceros is easily distinguishable by it broad square lip as its some times called the square-lipped rhinoceros, Black Rhinoceroses lips are a more 'pointed' affair. These magnificent animals are being poached in South Africa at a rate faster than they can produce. Last year 2013 the White Rhinoceros alone was poached and horribly mutilated in the process, at a rate of nearly 3 a day in South Africa, todate March 2014 37 have already gone, thats almost 2 a day. They are slaughtered to service in most part the Far Eastern 'powdered' rhino horn trade, used amongst other thing as an aphrodisiac!! This white rhinoceros photograph below could be all that is left to see in a few short years if we can not successfully combat this horrific barbaric act being commited it would seem at will by organised international gangs. We need your help, Rhino Revolution is one such organisation trying to combat the senseless slaughter here in South Africa.